Lymph node - Extramedullary hematopoiesis in a female B6C3F1/N mouse from a chronic study. 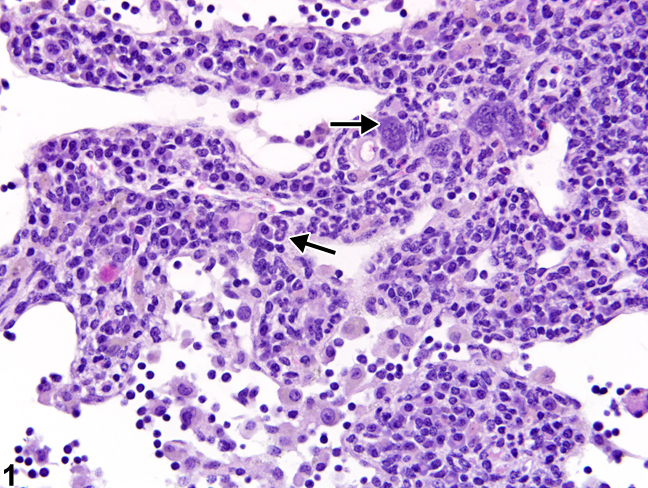 Increased numbers of hematopoietic cells are present within the lymph node medullary cords (arrows). 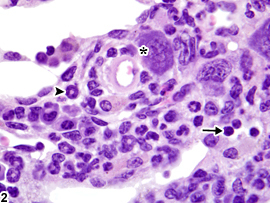 Lymph node - Extramedullary hematopoiesis in a female B6C3F1/N mouse from a chronic study (higher magnification of Figure 1). Hematopoietic cells include erythroblasts (arrow), immature granulocytes (arrowhead), and megakaryocytes (asterisk). While the bone marrow is the major site of hematopoiesis, lymph nodes may be a site of extramedullary hematopoiesis (EMH). EMH in lymph nodes typically occurs as a physiologic response to a dramatic loss or increased need for additional blood cells. Examples of inciting factors include hemorrhage, infection, severe inflammation, myelofibrosis, and neoplasia. EMH is characterized by a mixture, to varying degrees, of myeloid, erythroid, and megakaryocytic cells and is primarily present within the lymph node medullary cords ( Figure 1 and Figure 2 ). One lineage of hematopoietic cell may predominate, and various degrees of immaturity may be seen. EMH should be distinguished from inflammatory infiltrates and granulocytic leukemia. Inflammatory infiltrates in the lymph node are generally mature in development and may be a single or mixed cell type (see Lymph Node - Inflammation). Granulocytic leukemia is characterized by high numbers of immature neoplastic myeloid cells that involve multiple organs. Previous terms for extramedullary hematopoiesis include 'hematopoietic cell proliferation" and "myeloid hyperplasia." Extramedullary hematopoiesis in lymph nodes should be diagnosed and graded. The presence of this lesion in lymph nodes should prompt evaluation of other organs for EMH (especially the spleen and liver). Dunn TB. 1954. Normal and pathologic anatomy of the reticular tissue in laboratory mice. J Nat Cancer Inst 14:1281-1433. Kim CH. 2010. Homeostatic and pathogenic extramedullary hematopoiesis. J Blood Med 1:13-19. National Toxicology Program. 2011. NTP TR-570. Toxicology and Carcinogenesis Studies of α,β-Thujone (CAS No. 76231-76-0) in F344/N Rats and B6C3F1 Mice (Gavage Studies). NTP, Research Triangle Park, NC.